You are here: Home › Barn Owl facts and fun for kids › Barn Owl rescue! 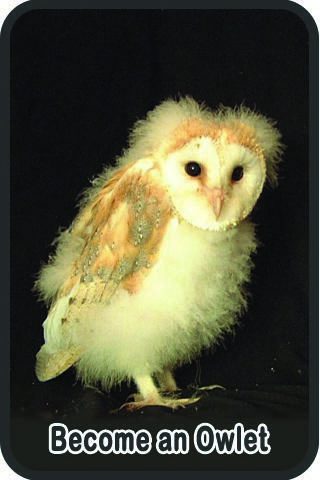 This young Barn Owl was rescued after a phone call to our Live Owl Emergency Advice line. She had only just learned to fly and she’d managed to get her legs tangled in baler twine and then get hooked onto barbed wire. She was trapped high up on an electricity pole, only a short distance from her nest. Luckily she was seen by a kind lady who lives on the farm nearby, in North Yorkshire. Glenda rang the Trust to ask for advice and then, despite her fear of heights, she decided to climb up a ladder to cut the string and release the owl. Fortunately the barbed wire was much lower than the live wires! “The owl was quite calm and I was able to gently snip away at the string” said Glenda. Having started to check the owl over; following the instructions on our website, she decided to take it to her local vet where the owl was fed and kept an eye on, overnight. The following morning the vet phoned to say that the owl had survived the night and was more lively; her talons were obviously working properly as she’d been trying to grab the vet (a good sign!). So from a brood of 3 or maybe 4, at least 2 owlets have made it.